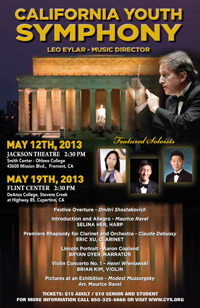 The California Youth Symphony Orchestra (Senior Orchestra) will conclude its 2012-13 season with a pair of concerts – on May 12 at 2:30pm in the Jackson Theatre, Smith Center, Ohlone College, Fremont (please note that this is a change of venue from Chabot College, Hayward) and on May 19 at 2:30pm at the Flint Center, DeAnza College, Cupertino. The concert represents something of a first for CYS, featuring three orchestral soloists and a narrator. The three soloists are winners of the annual CYS Senior Soloist Competition: Selina Her, harp, performs the Introduction and Allegro by Ravel; Brian Kim performs the Wieniawski Violin Concerto No. 1; and Eric Xu performs Debussy’s Premiere Rhapsody for Clarinet. A special treat for the audiences will be a performance of Copland’s famous Lincoln Portrait, with special guest narrator Bryan Dyer. Our final Senior Orchestra performances will feature a very special treat: Aaron Copland's stirring A Lincoln Portrait with guest narrator Bryan Dyer. Mr. Dyer is well known to Bay Area audiences as a prominent jazz singer and voice artist. Read more about this multi-talented musician.